Located in a peaceful neighborhood, Casa Minerva is a perfect place for R&R. It is fully furnished with Filipino hardwood furniture in the main rooms. 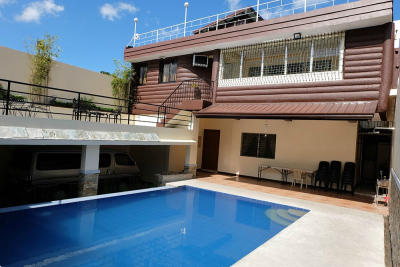 Rental rate includes use of private infinity pool, videoke, satellite TV, LPG, BBQ grill and wifi. 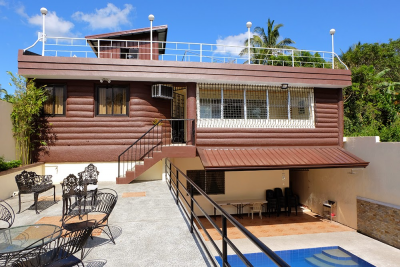 This 2 storey house has a floor area of 250 square meters and sits on a 240 square meter lot. It has 4 bedrooms (3 on the second floor and one on the ground floor), 5 bathrooms (2 en-suite), a fully equipped kitchen, and a two-car gated garage with concrete roof deck. Check out our gallery for more details. You may view our map and read our general and cancellation policies (please scroll down the booking page). Unavailable dates are marked pale red on the calendar. Our rate is PHP ﻿12,﻿500 per ﻿night﻿ and PHP 60,000 per week for a maximum of 20 pax. Rental rate is inclusive of use of private infinity pool, videoke, barbecue grill, wifi and LPG (for less than 7 days rental). Number of guests in excess of 20 will be charged an additional PHP 250 per head per night (for those who will sleep in the house) and PHP 125 per head (for daytime guests). Check-in time is 2 pm and check-out time is 12 noon (22 hours stay for single night booking). A non-refundable deposit of 50% is required for direct bookings. The remaining balance must be settled before check-in and will be collected by our caretaker. Our policy is to give the slot to the guest who makes the deposit first. This means that a guest who pays for the booking first will be given priority over someone who requested for the same date/s earlier but has not made payment yet. A ﻿security deposit﻿ of PHP 5,000 is required upon check-in and will also be collected by our caretaker. This will be refunded upon check-out if there were no damages to the property during the rental. ﻿﻿PHP 700 per hour ﻿﻿will be charged for late check-outs. For activities and events that require catering services, a corkage of 5% of the caterer's fee will be charged. We require ocular inspection of the house. If the guest opts to reserve the slot/date without seeing the house first and they don’t like the house for whatsoever reason, we will not be liable to refund the reservation fee. 1. Smoking is prohibited inside the house, including bedrooms and bathrooms. You may smoke at the balcony or lanai. 2. Drinking hard liquor is not allowed in the premises. 3. An inventory of items in the premises will be provided. 4. Any damages made on the property will be charged to the guest. PHP 1000 will be charged for wet/soiled mattress and upholstery. 5. Pay the remaining balance (if any) and the Security deposit (PHP 5,000, to be returned if no damages are incurred) to the caretaker before check-in. 6. Refrigerator is for use. We ask that you please empty the refrigerator of your leftovers prior to leaving. 7. The cooking tools are available for your use. Please clean up afterwards. 8. No outside visitors allowed without permission from the owner. 9. The house is privately owned. It is agreed that all guests are expressly assuming the risk of any harm arising from their use of the premises or others whom they invite to use the premises. Please observe safety precautions. 10. Keep the property and all furnishings in good order. 11. Only use appliances for their intended uses. 12. Pets are NOT allowed. 13. Parking: Vehicles are to be parked in designated parking areas only. 14. Housekeeping: There is no daily housekeeping service. While linens are included in the house, daily maid service is not included in the rental rate. We suggest you bring each towels and personal toiletries. 16. Pool: Children are permitted in pools at any time with adult supervision. There is no lifeguard on duty so please observe safety precautions. 17. Toilets: Please observe proper use of toilets. 18. Storage rooms, caretaker's room and the open laundry drying area at the rooftop of the house are off limits to guests. 18. CLEAN AS YOU GO. Please be considerate as we may have guests checking in 2 hours after you check out. 19. Fortuitous Events: Reschedules can be made in such events. 20. Noise curfew is at 10:00 pm. No shouting, loud singing and loud music after 10:00 pm. 21. Bringing mobile gadgets (boom box, speakers, amplifiers etc.) is not allowed without prior notice and can be charged (PHP 500). 22. Check out time is 12 noon. Allow at least 15 minutes for the caretaker to check for any damage or loss prior to check out. Deposit is non-refundable and cancellation is not allowed. Change of booking dates may be allowed on case to case basis. Please contact Minerva (owner) at +63917-5516393 or send an email to admin@tagaytayhouse4rent.com if you want to change the date of your booking.